Do you have radio programs and recorded family moments on old 5/16 inch (1/4 inch) cassette tapes. It is time to transfer these cassette tapes to CD. These recordings are priceless and should be preserved in a format that is stable and useable. 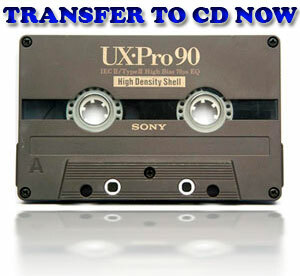 We can transfer & convert all of your 2, 4 & 8 track cassettes. We can also convert Vinyl LPs, Mini/Micro as well as DVD-R.
After the quality restoration your CDs or MP3 files will be like new and better than the originals!! We can convert your cassette tapes to CD or DVD format. Need MP3's for your portable player? No problem. Avoid the hassle of transferring or converting formats, let the experts digitize for you! Don't let time ruin your media. Transfer Your Cassette Tapes to CD NOW! We use Taiyo Yuden DVD+R/CD-R when we transfer your cassettes to CD, these disks are the best on the market.